The government is planning to stop providing electricity and natural gas connections to industries established in unplanned areas. “Unplanned urbanisation and industrial expansion are major obstacles to ensuring uninterrupted electricity and gas supply,” State Minister for Power and Energy Nasrul Hamid said on Saturday at a roundtable discussion organised by the daily sun. 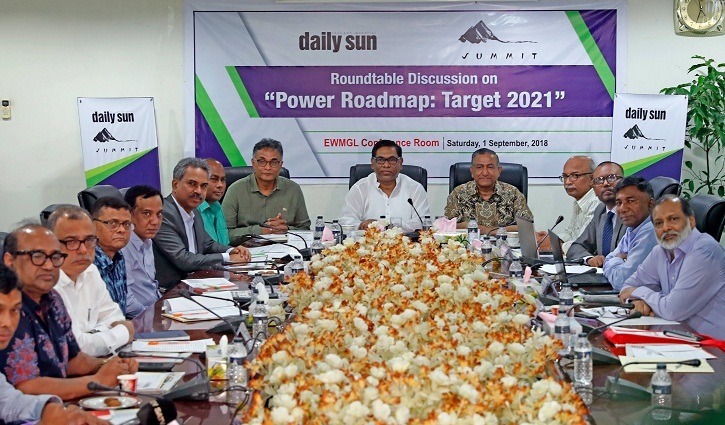 Planned residential areas like Gulshan, Banani and Baridhara have turned into commercial areas, making it more difficult to assess the electricity demand, the state minister said while addressing the roundtable styled ‘Power Roadmap: Target 2021” as the chief guest at EWMGL conference room. “Industries, especially the apparel industry, should think about shifting their units to planned industrial areas,” Nasrul Hamid said, adding that from now on, power distribution companies have to be very strict about not providing any electricity connections to industries outside the planned industrial zones. The government has already decided not to provide any new gas connections outside export procession zones or industrial parks after December 31, 2021. The state minister stressed the need for utilising the daylight more efficiently to ease the pressure during the peak hours. “The demand is endless. Per capita power consumption is currently 500Kwh, which should be 1,200Kwh to 1,500Kwh for a mid-income country,” the state minister said. Power secretary Dr Ahmad Kaikaus attended the roundtable as the special guest while Power Cell Director General Mohammed Hossain presented keynote paper. The roundtable was chaired by daily sun Editor Enamul Hoque Chowdhury. Daily sun executive editor Shiabur Rahman moderated the discussion. Summit Power Managing Director Abdul Wadud, Rural Electrification Board (REB) Chairman Moin Uddin, Managing Director of Coal Power Generation Company of Bangladesh Limited Golam Kibria, Prof M Tamim and Prof Ijaz Hossain from BUET, among others, spoke at the roundtable. “It is the difference between you (analysts) and us. There are some problems but those are not load-shedding whatsoever,” he added. He, however, said they admit to some load shedding in Rangpur and Rajshahi regions caused by low voltage caused by the shutdown of Barapukuria coal-based power plant. He said affordability is no longer an issue though power tariff was hiked on eight occasions in last 10 years. “I personally think that people are happily paying the increased tariff as their first priority is accessibility; not affordability,” he said. He said in 2008-09 fiscal, 85 per cent of the country’s electricity was generated from gas which has come down to 58 per cent now. “32 per cent electricity is being produced using fuel oil, which is the key concern now,” he noted. M Tamim said mobilising funds for costly LNG import will be a major challenge as the government targets to import 4 billion cubic feet of LNG per day by 2023-24 at a cost of around $15 billion per year. Professor Dr Ijaz Hossain of the Department of Chemical Engineering, BUET, said although the government has made huge development in power generation and power penetration, the progress has not become sustainable and the policy has flaws. The government has not fixed any concrete plan on the captive power generation till now just because of the lack of reliable power generation, he said, adding that the rising LNG price will affect power tariff in future. In his keynote, Power Cell Director General Mohammed Hossain noted that as a result of timely and dynamic moves of the government, power generation growth of the country is now 10.2 per cent while the total generation capacity has reached over 20,000mw from only 3,268mw in 2009. Access to electricity is 92 per cent in the country now, which was just 47 per cent in 2009, he said, adding that the government is very close to meeting its 24,000mw electricity generation target by 2021 as the total generation capacity is now more than 20,000mw. The country will see a demand for 30,000MW in 2030 and the government is targeting to produce 40,000MW of electricity by then, according to the keynote. The demand for power in Bangladesh could reach 48,000MW in 2041 and the production target has been fixed at 60,000MW by that year, Power Cell Director-General said. He also suggested the government to privatize the transmission and distribution services to facilitate smooth and cost-effective supply of electricity. Bangladesh Rural Electrification Board (BREB) Chairman Major General Moin Uddin (Retd) said BREB covers 80 per cent of the rural population. He also said the country’s electricity coverage has reached 92 per cent, meaning that only 34 lakh customers remain out of the electricity coverage. “REB reached electricity to 39 lakh customers in last one year, which was a milestone. In last three years, REB provided electricity to 1.12 crore people,” he said. Coal Power Generation Company of Bangladesh Limited Managing Director Golam Kibria said the unit-1 of the Matarbari 1200MW coal-fired plant will commission by January 2024. Besides, another unit of the plant will start producing electricity by July 2024. He said coal transportation remains a major challenge for the coal-fired plants, adding that they will create a 14.5-kilometre waterway to facilitate smooth transpiration of coal. “We are hopeful of completing the Matarbari deep seaport channel by 2022,” Golam Kibria said. Bangladesh Garment Manufacturers and Exporters Association (BGMEA) Senior Vice-President Faruque Hassan said the garment exports stood at $11 billion when the current government took office in 2009. “RMG exports have already crossed $30 billion. The apparel sector is enjoining the advantage of a rise in electricity generation,” he said. Faruque Hassan, who also Managing Director also Giant Group, said the private sector we can install more energy efficient machinery as being installed by the garment factories. Speaking at the roundtable, Bangladesh Pratidin executive editor Pir Habibur Rahman said rural areas are also enjoying uninterrupted power supply. He also stressed the need for introducing smart prepaid meters in the rural areas as well. News24 executive director Hasnain Khorshed termed the tremendous development in power sector as an encouraging and positive sign for the country and its people. The authorities will have to anticipate the future demand of electricity and make plans according to increase power generation, he said. Thanking the dignitaries for their participating at the roundtable, Daily Sun editor Enamul Hoque Chowdhury said the country’s power sector has seen tremendous progress under the visionary leadership of Prime Minister Sheikh Hasina. The premier made the power sector a priority after assuming office in 2009 as she could realise the importance of the sector in the country’s development, the daily sun editor said. He also lauded the role of state minister Nasrul Hamid in transforming the country’s power sector as per the government’s power sector roadmap.